They make great pets, are good for the garden and keep your breakfast plate filled with fresh, free-range eggs. But is keeping backyard chooks really as good as it’s cracked up to be? Once upon a time in Australia, it seemed almost every house had a few chickens in the backyard. But as the cost of commercially-produced eggs lowered and the average house-block got smaller, so too did the number of backyard layers. More recently, while there are still around 19 million hens kept on commercial layer farms, anecdotal evidence suggests the interest in raising chooks at home is on the rise again, adding a slice of country life to the average suburban street. There are a few key things to consider before you get too clucky, including the local regulations around keeping chickens in your area. While the overall laws are determined by each state or territory, in some cases local councils have created bylaws to determine everything from how many chickens you can keep (depending on the size of your block), to whether or not you can keep roosters (in most cases roosters are prohibited in suburban areas due to noise disturbances). Some councils also require you to apply for a permit to keep livestock such as chickens in residential areas. There are plenty of factors to consider when deciding on the type and positioning of your chicken coop and run. Council regulations may restrict its proximity to your boundary fence, while other elements to consider include its orientation (north or north-east is best, with shade from the hot afternoon sun), its size (depending on the breed and how many chickens you are keeping) and its ability to provide protection from predators (you’ll need to enclose the chicken run in wire netting and provide a fox-proof coop that can be shut up at night). The chicken house should include a perch for roosting and nesting boxes for laying eggs, with a deep layer of sawdust on the floor. 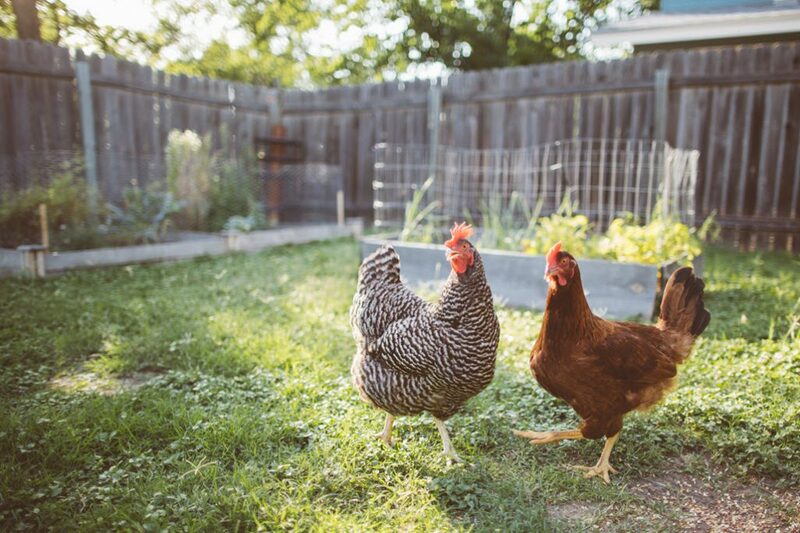 Giving your chickens the chance to roam free in your backyard is also beneficial, and will ensure they are happier, healthier and lay bigger eggs. The next thing you need to think about is why you want to raise chickens in the first place? Is it for their eggs, their meat or as a pet? There are countless pure and hybrid breeds in Australia, each with their own unique characteristics, so it’s important to do your research to choose the right one. Popular breeds for egg laying include ISA Brown, Black Australorp, White Leghorn and Rhode Island Red. Hens will generally begin laying eggs from five or six months of age and can lay anywhere between 120 and 300 eggs per year, depending on the breed. Eggs are a great source of protein, antioxidants, vitamins and minerals such as vitamin A, vitamin D, vitamin E, folic acid and iron, making them an essential part of a balanced, healthy diet. Recent studies have shown that eating one egg every day will have almost no effect on your blood cholesterol levels and may even reduce your risk of heart disease and strokes. Free range chickens are great to have around the garden, controlling insects and weeds, and loosening soil while scratching, while also providing a wonderful natural fertiliser. They can also help reduce household waste by eating a range of kitchen scraps, although to ensure good health and egg production, chickens require a balanced diet that includes both grain and commercial layer pellets, as well as constant access to clean water. Hens that are well looked after and fed a healthy diet can live for up to 15 years, depending on the breed. Caring for pets, including chickens, can also have physical and psychological benefits for their owners, with research showing positive effects on everything from cardiovascular health and reduced visits to the doctor, to improved self-esteem and a more positive outlook on life.